Because we live in a three-dimensional world, it's tempting to directly translate the spaces in which we live and work to virtual, three-dimensional spaces. While these translations are usually quite legible – if a space looks like its real life equivalent, its use is quite obvious – we believe that such translations don't take advantage of all that three-dimensional worlds have to offer. We are designing meeting spaces for Second Life that take full advantage of its features that set it apart both from other mediated environments and real-world meeting rooms. We hope that these meeting spaces will be useful tools in their own right, as well as providing a framework for the design of future interactive spaces in virtual worlds. Part of the unexplored promise of virtual spaces is their potential for architectural flexibility. Virtual spaces can be instantly created, resized, and adjusted to fit different situations. In the context of meeting spaces, this means we don't have to use the same meeting room for brainstorming, presentations, decision-making, project planning and status reports. Each of those tasks can have their own specific design, and people can move fluidly between them throughout the course of a meeting. 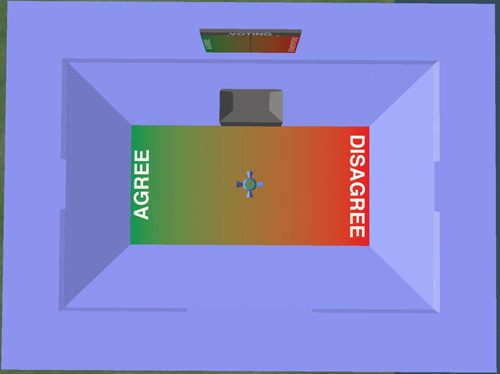 In this phase of the project, we have a draft of one such meeting space design for discussions where there is a clear agree/disagree continuum. For example, this might be appropriate for discussions about funding decisions, community town-hall discussions, or hiring decisions. We have created a social vocabulary for the space that lets people communicate based not just on text chat, but also by the movement of their avatar around the space. This gives people non-verbal ways to communicate about the meeting. We use familiar architectural cues to make this vocabulary legible. The space is arranged a bit like a sports stadium, with the agree/disagree continuum as the focus. Around that area is space for participants who don't want to commit to a particular position on the continuum. Next to the continuum is also a podium space for a moderator. The moderator has a number of tools at their disposal to manage the discussion. An observational area for people who don't want to participate in the discussion at all is separated by a short wall from the main area. By placing themselves within this space (and relative to other people in the space) participants can communicate their role and attitudes about the topic being discussed. Beyond the architecture of the space, we have also created a number of tools to augment the meeting which we discuss in more detail below. 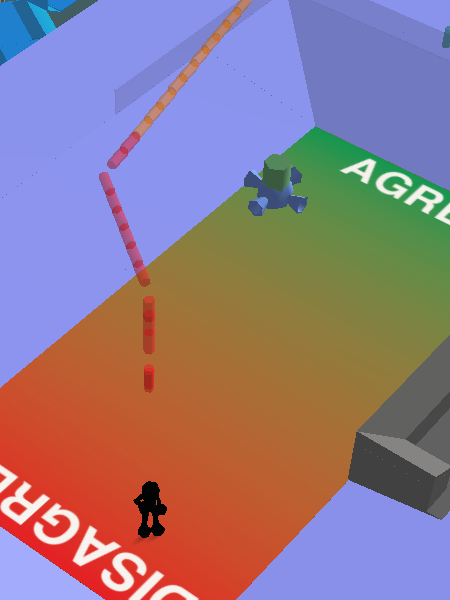 While people moving around the agree/disagree space is meaningful on its own, the space also provides an aggregate summary on a display behind the moderator's booth. 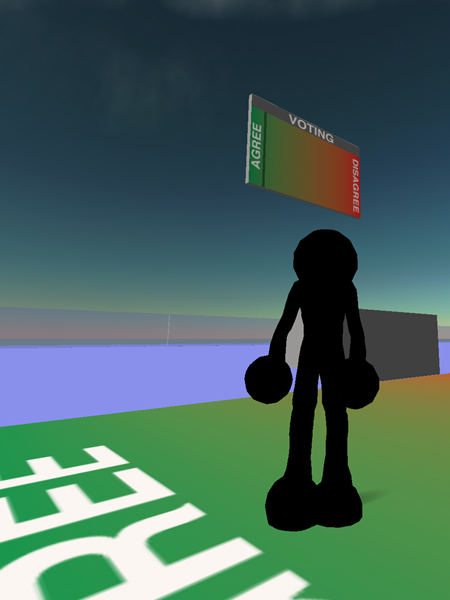 The display can be toggled in situations where voting isn't going on. 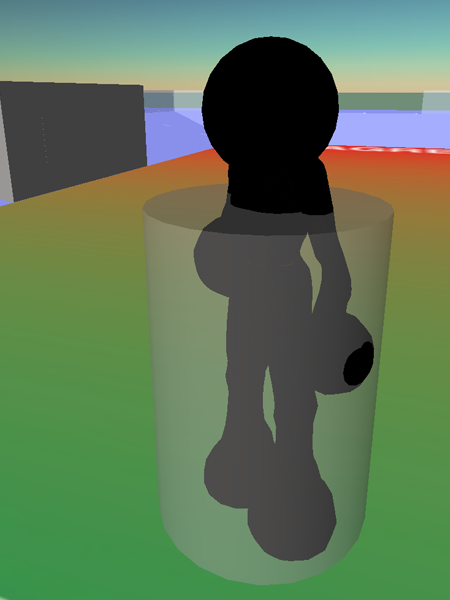 Because the space assigns significance to where avatars are standing, it is important to provide more information about an avatar's position than just where they are currently located. The first part of this system is a visualization of how long an avatar has stood in their current location. Once they've been there for a few seconds, a translucent cylinder will start to rise slowly up out of the ground. The taller it is, the longer that avatar has been in that position. Once they move, the cylinder rapidly shrinks and disappears. The dwell visualization is a simple, in-context way of showing a little bit about the history of an avatar's position. The meeting space also provides a visualization of avatars' complete movement and chat history in the space. As avatars move in the space, their paths are traced out in the sky above the space. These paths rise slowly, so the most recent paths are close to the floor of the meeting space and older paths are farther up. Chat messages are also recorded, displaying who said what and where they were in the space when they said it. 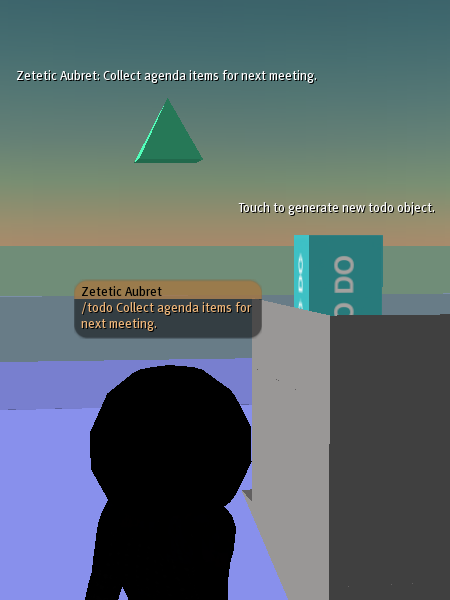 In the moderator's booth is an object that generates todo objects. These objects store the text describing their task, and can be claimed by meeting participants. When claimed, the todo object hovers over their head so they don't forget about the task they volunteered to do, and other people in the meeting can see that they already have accepted a task.